When you’ve chosen your e-commerce platform, it’s time to determine the payment system to integrate into your business model. We’ve prepared a guide for payment gateway comparison, which we hope you’ll find helpful. Our lives are bound and defined by our buying ability. And this demands a variety of options in the quest for performing a purchase. Modern times require the inclusion of every possible opportunity. That’s where it starts getting a bit complicated. Payment gateways in eCommerce are tricky. They are right in the foundation of any eCommerce platform because there is no other way of performing transactions online unless you’re an underground guerrilla with your payment system at hand (if you are one of them — please contact us). Because of that, you can’t build a successful eCommerce platform without providing a variety of payment options. One of the main challenges is that all gateways work differently and various limitations make a particular option more preferable than the others in certain situations. While some of it depends on the chosen business model, there are still many factors merchants can’t influence. The amount of options is disorienting, and the way various payment gateways present themselves isn’t helping. The fact that there are too many options to choose from and it is hard to tell which are better and why is a challenge for any eCommerce Businessman. Last year we worked on an eCommerce marketplace. It was a big long-running project that offered many challenges to our team. One of them was selecting and implementing various payment systems to cover the broadest possible audience. Our developers and project managers had performed extensive research on the subject, and this is its recreation in a narrative form. For your consideration — a comparison of the advantages and disadvantages of the top payment systems. If there is one payment system that is arguably the most technologically advanced and it the same time the most accessible — it is probably PayPal. No wonder — it started as an Elon Musk’s startup a long time ago — it couldn’t be anything else. PayPal seems like a standard option for any eCommerce business. User reach is immense (aside from a couple of notable exceptions) as is user trust. It is perfect for both for general purpose marketplaces and niche shops. According to the recent study of Nielsen’s Online Buyer Insights — online stores with PayPal paying option to generate a higher conversion rate than those who don’t — the number goes up to staggering 44%. Set a URL for IPN Listener to create notification feed to keep track of transaction events as they go. If you would like to integrate PayPal into your website, you’ll need a business account (for other transactions, you can use a personal one.) PayPal business account fees are quite affordable - for sales within the US it’s 2.9% + $0.30 per transaction, and for international sales, it’s 4.4% transaction fee plus a fixed fee based on currency received. Check out the PayPal invoice fee as well as other fees on the website. The issue users are mostly concerned about is security. Stripe was designed to hush their worries and offered several innovative solutions to monetary transactions. 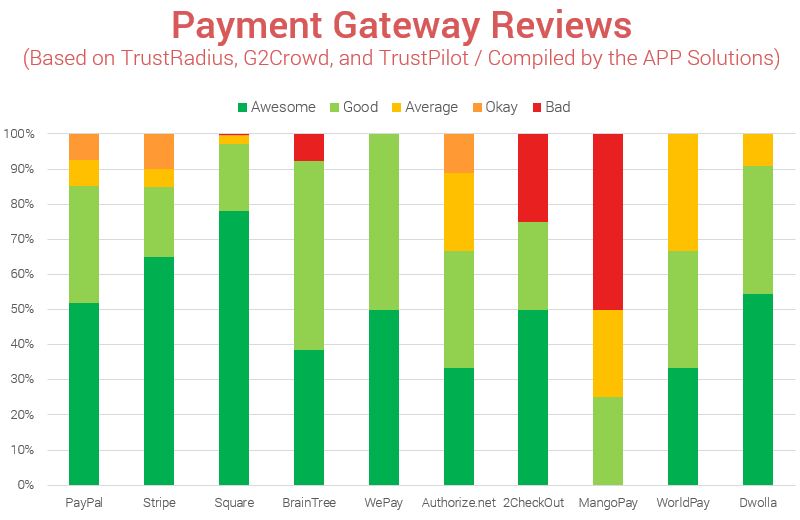 According to G2Crowd payment gateway research, Stripe is so good at doing its job, it became Paypal's biggest competitor. Here’s how it goes: transaction goes as usual but upon confirming it — the information about the payment passes internal data store and goes straight to secure internal servers the secure servers. There it goes through extensive checks on credibility and fraudulence. Stripe integration thoroughly documented and is relatively easy to do. Also, it should be noted that Customer support is extremely responsive. By the way, Stripe, as well as PayPal, make great mobile payment gateways. In terms of fees, the Stripe's credit card processing fee is 2.9% + 30¢, international fees add another 1% on top, and there are also other payment methods. Square (formerly known as SquareUp) is a bit player in comparison with the other payment systems, but it compensates its lack of reach by very flexible customization of API and a wide variety of available types of payments. It is also a perfect choice if you need to make a custom solution. Square’s most significant advantage is that it provides very flexible payment customization. It is also very comfortable for medium-scale employee management. Another great thing is thorough reporting that gives you a very clear big picture of what is going on with the payments in the store. Square Point of Sale app is a very flexible tool for small-scale payment operations, which makes it a convenient WooCommerce payment gateway (since often, WordPress’ e-commerce platform doesn’t need huge transactions). In the meantime, Square for Retail provides a full set of tool for large-scale payments. User reach and security are not end all be all priorities for the payment system. Sometimes eCommerce platform needs more functional diversity, and that is what Braintree is more than capable to do. Braintree is part of PayPal, but it offers a slightly different experience. Aside from standard card payments — it also accepts from a variety of web wallets (including but not limiting to Venmo, Coinbase, Android Pay, Apple Pay). Braintree provides a thoroughly written API that makes integration an easy task for any online store. One of the main advantages of Braintree — instant separate transfer. Single checkout with multiple items in a cart from different sellers. What is WePay? WePay is one of those payment systems that offer more of the same features but in a more refined and elaborate form. Its main difference from PayPal is that WePay does the same thing without messing around. Unlike PayPal transactions which involve redirects to a third-party site — WePay keeps all in the house (something that costs additional 10-$35 on PayPal). In many ways, WePay is perfect for smaller-sized businesses and crowdfunding campaigns. It is also a go for general purpose online-based transactions. In the case of increased money flow — it becomes increasingly clumsy. In terms of integration, WePay is probably the most flexible of all reviewed payment systems. The API is well-written and fits like a glove on any online store. If there is one contender for an old-school electronic payment system — then it is Authorize.Net. It also allows merchants to use third-party platforms for incoming payments with lowered fees. Its advantage is in simplicity. Authorize.net is miles easier to master the likes of PayPal and Stripe. It takes just a couple of clicks to set up right threads with the eCommerce platform. Authorize.net is compatible with every universal shopping system. 2CheckOut is a twofold service. It can act both as the payment gateway and merchant account. From the usability standpoint — it is probably the easiest to use — you need to register, verify your account, and you can start accepting payments. 2CheckOut's advantage is the number of options available for the user — you can customize subscription plan to minuscule detail, you can make your in-site checkouts. The most exciting thing is demo mode where you can test out customer’s buying experience with a variety of settings. This thing can seriously help refine the user experience. 2CheckOut provides simple API that embeds payment processing right into your site. MangoPay is a payment system designed explicitly for eCommerce marketplaces and crowdfunding platforms. Its biggest advantage over the other payment system is dashboard with an intuitive interface that makes handling of transaction seem like a no big deal. MangoPay offers a variety of options that allows merchants to set up automatic payouts through an electronic wallet for every participant of the process — from sellers to buyers. It also uses Know Your Customer processes and anti-money laundering checks. Because of its customization features, it fits best for international markets. Since the United Kingdom is a bit of “an-sich” lately it is reasonable to add payment solution specifically for that country. WorldPay is a UK-based service that provides fast and safe transaction on standard fees. It offers a wide variety of paying options adapted to different countries and specifically for the UK. One of its primary advantages is an automated billing and card updates, customizable loyalty cards, etc. Another essential element is the option of expert advice and personalized reporting. It is also helpful that there is a whole lot of useful information on their blog. As for integration — it is all simple and fits every primary shopping system. Dwolla is a fast growing payment gateway service designed to make bank transfers smoother and more comfortable to digest. And it manages to do that through nice and easy API with numerous features and even more satisfying user experience via the dynamic interface. Among other goodies Dwolla has to offer is flexible customer management and proper account verification. Many features allow multi-layered sequences of payments and invoicing. Overall, it is a good fit for enterprises of large scale, small and medium scale businesses. We love to shop - whether it's for groceries or clothes or technology - and the purchasing ability, as well as the availability of buying options, makes this process even more enjoyable. Besides the offline stores and window-shopping experiences, people shop online more and more and this is why online payment services matter so much. While it might look as if there are way too many options for an e-store owner, each gateway and platform has their own pros and cons. In case you need help with narrowing down the options, we have done extensive research about them and can help. We hope this comparison will be helpful to those who want to understand which payment system is a better fit for their eCommerce marketplace.